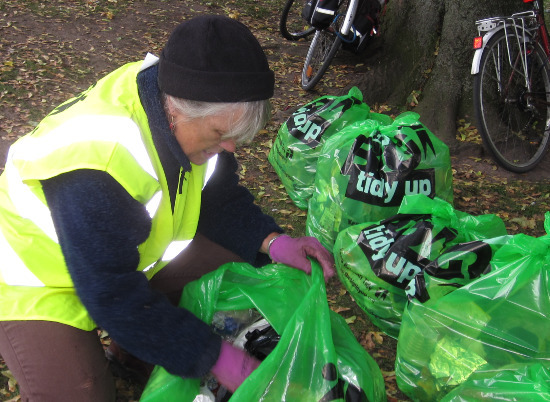 On Sunday 24th October our regular pickers took on the bottles and tape of King George V park in Wordsley. Bottles and tape? Yes, bottles and tape – you see, it seems that footballers use tape to hold up their socks, and drink sports drinks at half and full time, before lobbing the empties all over the grass. Note to Dudley MBC; get your enforcement people down there on match days for a guaranteed haul of litter louts. Ooops, forgot for a minute there that you only work weekdays between 9am and 5pm. Our eight helpers filled twelve bags between them – but remember that as a council park the grounds are supposedly kept clean on a regular basis by the green care staff. Clearly they’re not capable of doing a very good job. As we’ve seen before at Mary Stevens Park and Greenfield Park, council operatives don’t really walk very far from their vehicle. You have to get into and under the hedges and shrubs to do the job properly. Once again, coffee and cake were available afterwards – and everyone went home with a voucher for 25% off fish and chips for a week, courtesy of Norton Fisheries on The Broadway in Stourbridge. It’s now too dark to litter pick in the evening, so weekends have taken over. After a massive hoard of bags in Mary Stevens Park a fortnight ago, could we do better if we set out from the Bonded Warehouse? Just nine people could pull themselves away from whatever people normally do on a Sunday morning. We set off along the canal in both directions; some people being delivered to Rushall Close to come the other way. Some went to the Red House Cone and worked back from there. I ended up stuck at the Bonded Warehouse, but set to work on the subway garden area beneath the ring road. 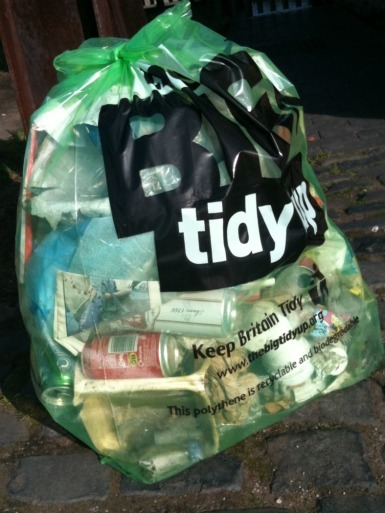 I collected two bags of litter here – the image below is just one of them. After about 90 minutes of picking our intrepid nine had collected a staggering fifteen bags of litter, making popular areas of Stourbridge much more pleasant for everyone else. To reward ourselves we had a coffee, and enjoyed some cake made for us by Shelly. 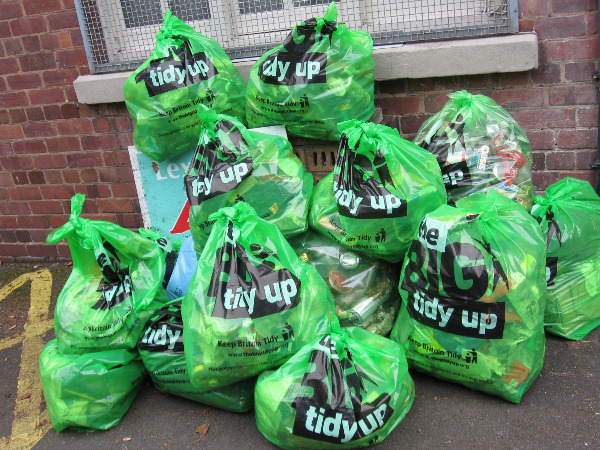 Sixteen bags of litter were collected from the bushes and shrubs of Mary Stevens Park during TidyStourbridge’s first Coffee’n’Clean held on Sunday 26th September, 2010. Volunteers gave up an hour or two to help, and passers by also joined in. Together we reached the parts of the park other litter pickers can’t reach. By ‘other litterpickers’ we refer to the park staff who are paid to do this job. How can it be that a small group of amateurs can collect 16 bags of litter in a little over an hour, when the park is supposedly cleaned regularly by park staff? We did have some interesting finds too. We found 10 cans of ‘in date’ cider, a number of champagne bottles, and, curiously, some male and female underwear! One point of concern was that people seem to be driving to the park and fly tipping in the car parks. Something for Dudley’s enforcement teams to keep an eye on. It was nice to be approached by members of the public asking us about TidyStourbridge. Hopefully we’ll see them at the next Coffee’n’Clean on Sunday 10th October at the Bonded Warehouse. Every weekend Mary Stevens Park is invaded by some very dirty people, as the picture above shows. 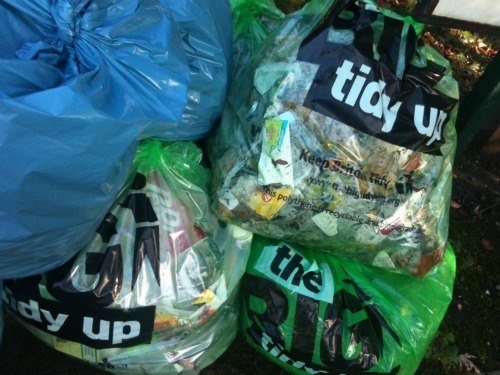 We want to give the place the TidyStourbridge treatment this coming Sunday afternoon. Please come along for some social litterpicking. Meet up by the main gates at 2pm for an hour or so of work followed by a coffee and cake. All equipment supplied. Also, following the success of the last Pick’n’Pint we have further support from Norton Fisheries to again offer a 25% discount off food purchased valid for one week. You could save a lot of money with that offer.